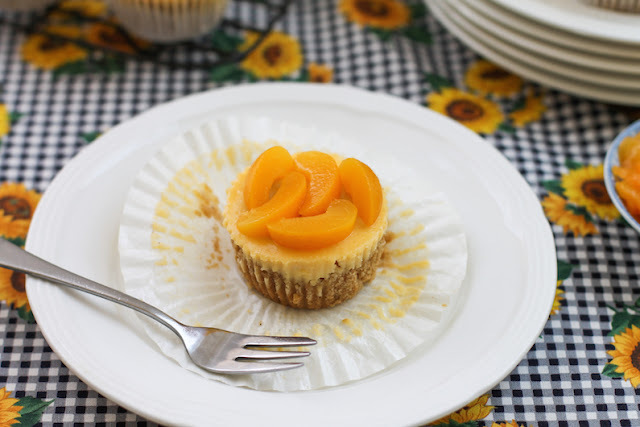 These delightful cheesecake breakfast muffins would be a hit at your Sunday brunch but they are so easy to make that your family could even enjoy them on a weekday. Life is funny sometimes. 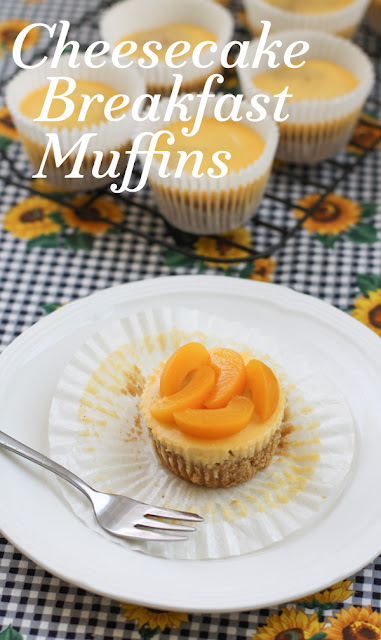 This month for Muffin Monday, I got the idea that I wanted to make something different so I started searching online for variations on muffin recipes. When I came across this one from Sainsbury’s, I knew I had a winner. Or at least a winning idea. Low fat cheesecake did not sound ideal. So I created a full fat, amped up version. I hadn’t really considered why I wanted to make something different, something special this month. Sometimes I’m just like that. But as I scrolled back through our Muffin Monday page, I realized that it’s been exactly three years since I started this little group. Our first post together was August 2015 and we shared six beautiful muffin recipes. Of course I needed a special muffin to celebrate! (Could I have known subconsciously?!) I think these do the trick. 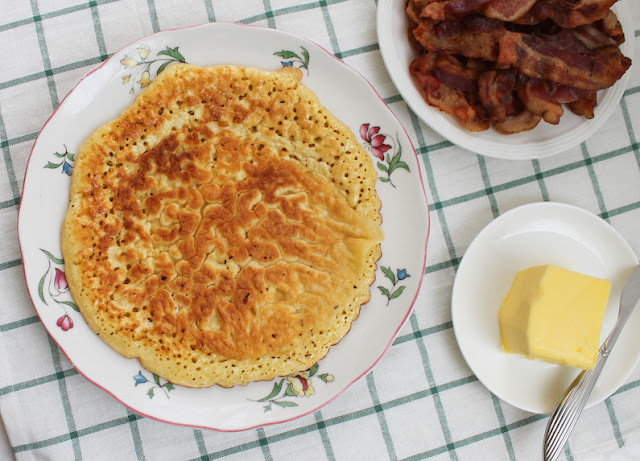 This recipe is adapted from Sainsbury Magazine, for some reason listed under Pancake Day. 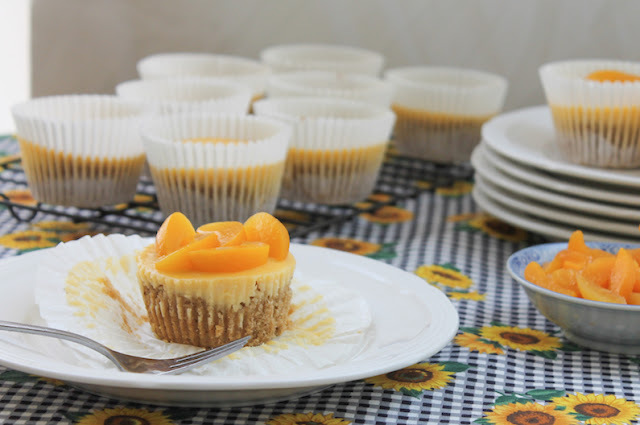 The topping can be made ahead and kept in the refrigerator to make baking even easier early in the morning. Preheat the oven to 350°F or 180°C. 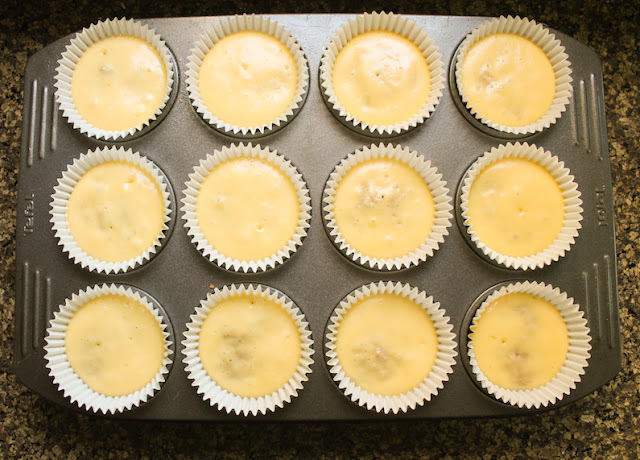 Line a 12-hole muffin tin with tall paper muffin liners. I spray them inside with baking spray to help the muffins release from the papers, if you want to serve them without. To prepare the topping, use a fork to beat the softened cream cheese in a small bowl. 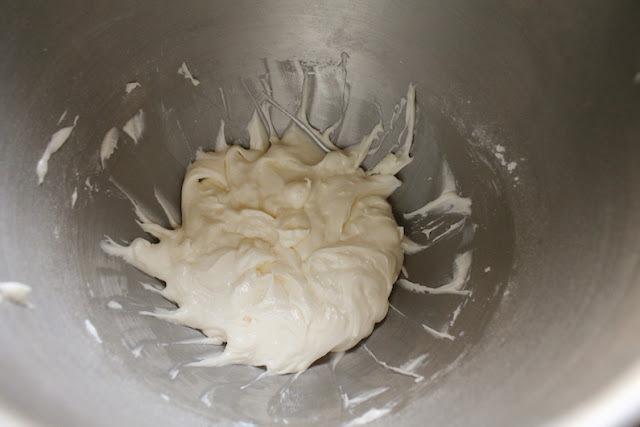 Add the yogurt, sugar and cornstarch and stir until combined. Add the beaten egg and use the fork to mix it in thoroughly. Chill. In a large mixing bowl, whisk together the whole wheat flour, almond flour, sugar, baking powder, cinnamon and salt. 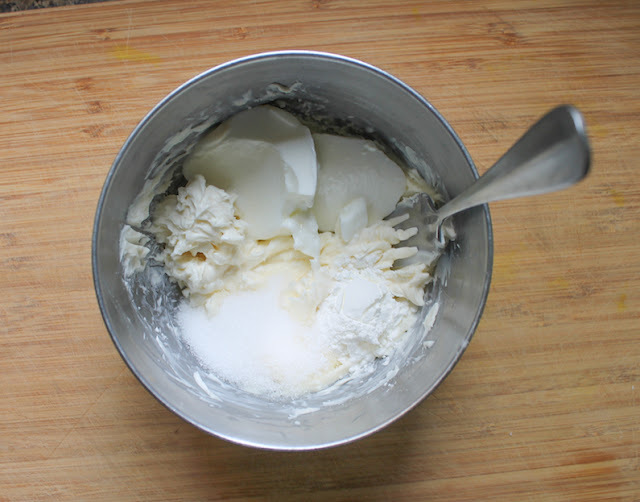 In another bowl, whisk together your milk, butter and egg. 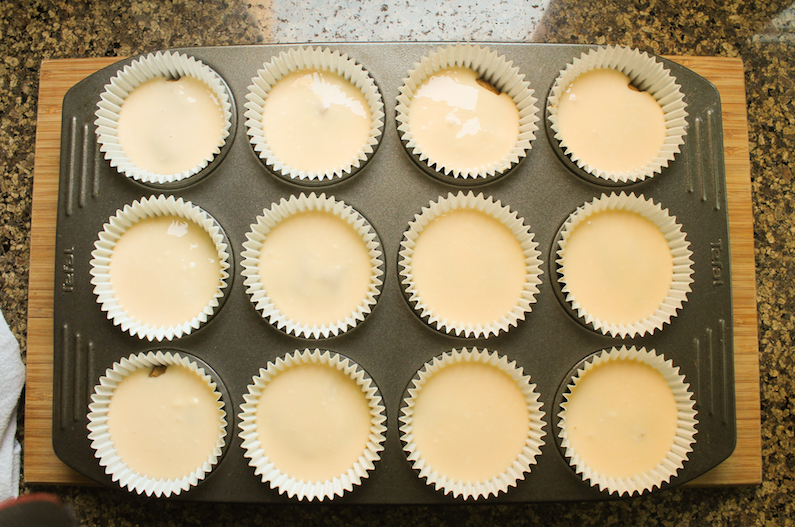 Bake for 9-11 minutes or until the tops have set. The muffins will not be cooked through yet. Spoon the cream cheese topping over the muffins and return the pan to the oven for another 9-11 minutes. 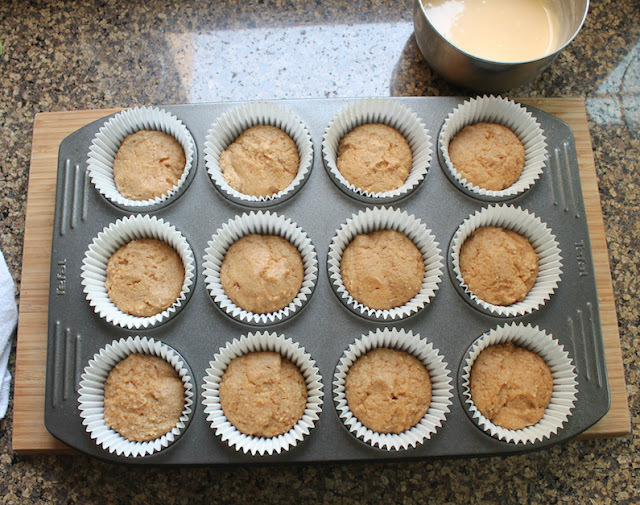 Leave to cool in the muffin pan for 10 minutes then remove to wire rack to cool completely. 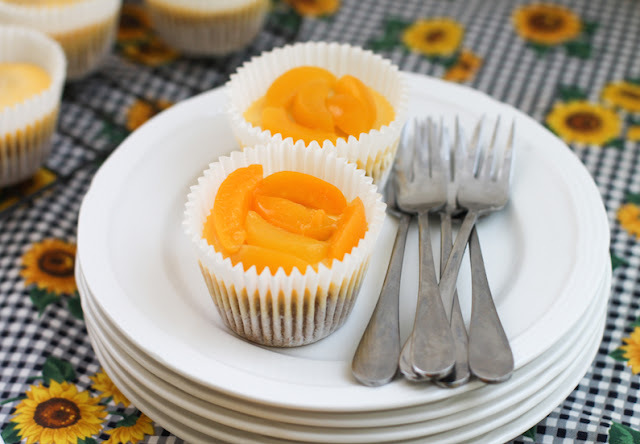 If you aren’t serving them right when they’ve cooled, store them in the refrigerator in a covered container. Remove from the refrigerator an hour or two before you want to serve them, adding berries or fruit just before serving. Or take the papers off. 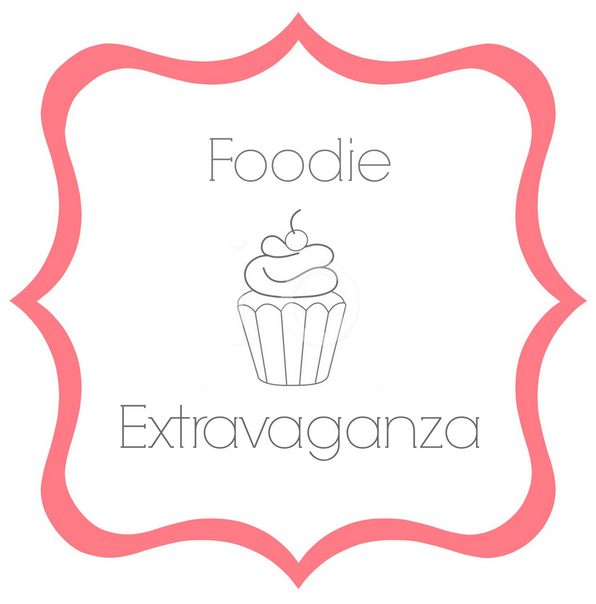 Make sure you check out the muffins we are sharing today! Many thanks to all my Muffin Monday participants over the last three years. It's been such a pleasure. This sweet corn bacon skillet cookie is the perfectly sweet and salty combination adored in Momofuku corn cookies, made more delicious with the addition of bacon. 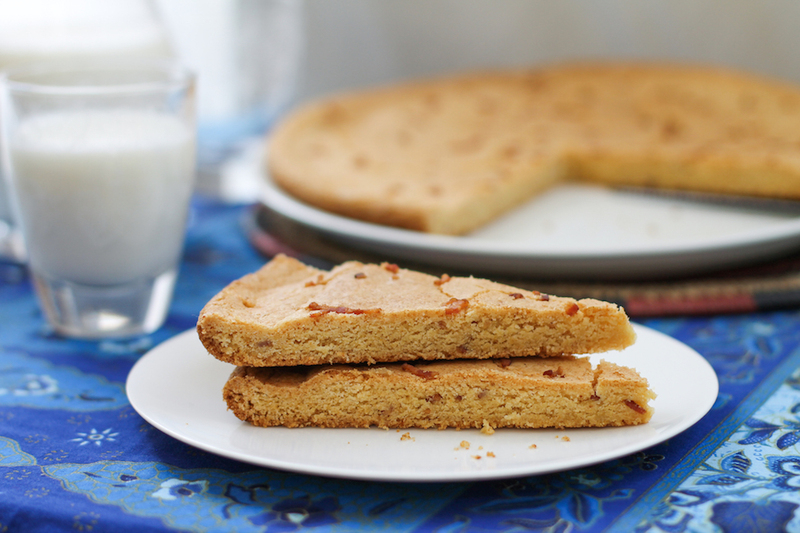 And made easier as one big cookie to slice and serve. A couple of years back, my elder daughter introduced me to what was then her new favorite cookie. Rich, buttery, sweet but a bit salty, those Momofuku corn cookies were chewy and completely more-ish. 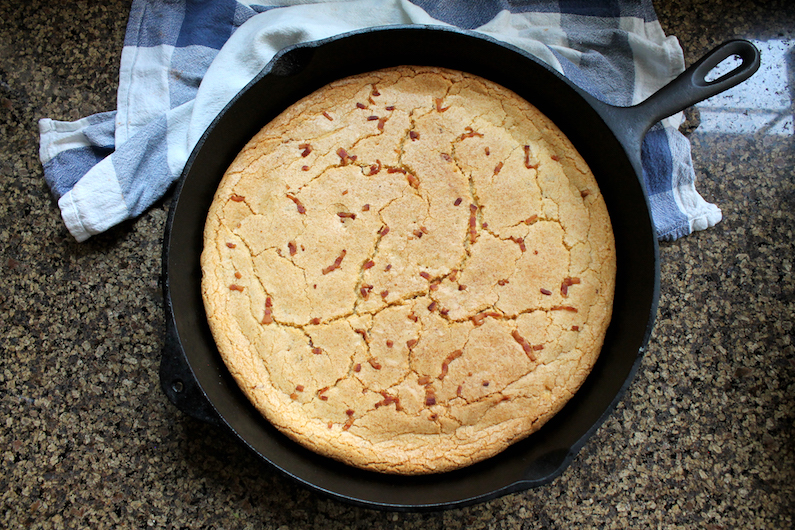 When this month’s Creative Cookie Exchange theme of “Big Cookies” was announced, I couldn’t wait to recreate them as a cast iron skillet cookie and, of course, add some bacon. 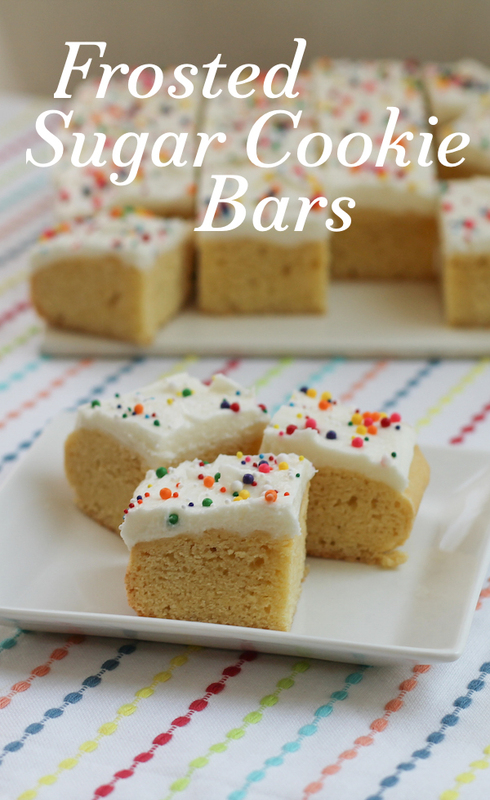 This recipe is adapted from my version of the original Momofuku corn cookies. If you like salty and sweet together, make the originals or make my bacon version. 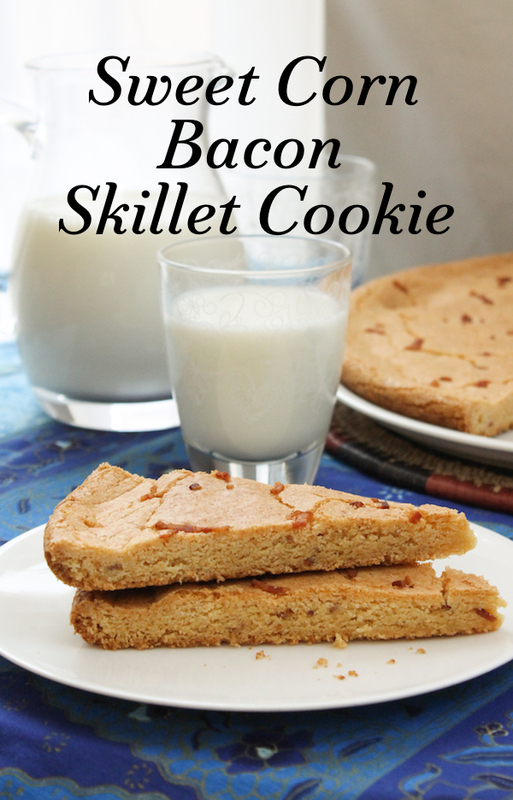 This is going to be your new favorite cookie too! Note: I used Karen’s Freeze Dried Corn* in this recipe, measuring out 65g and then blitzing it into powder using a food processor. 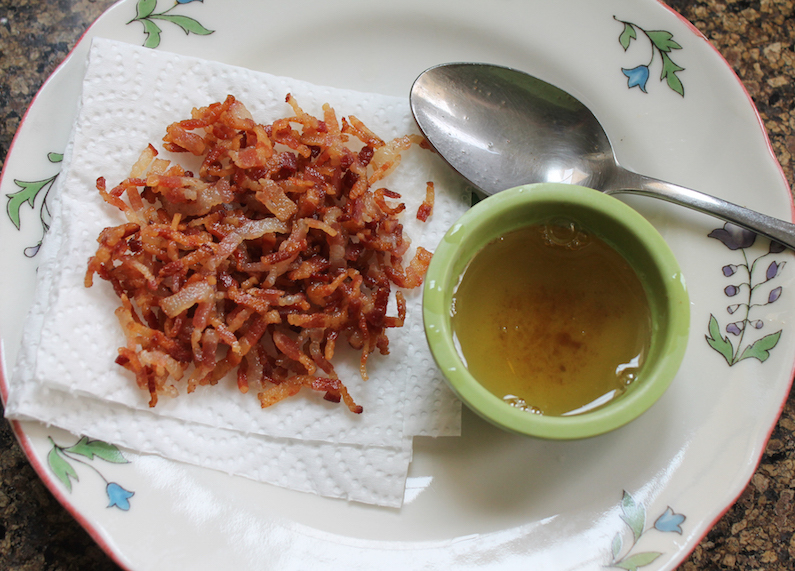 Fry bacon bits in your iron skillet until just crispy. 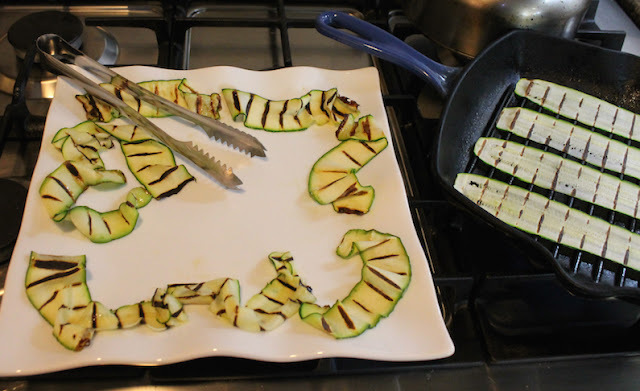 Remove from the pan and drain on paper towels. Reserve 2 tablespoons rendered bacon fat to use in the dough. 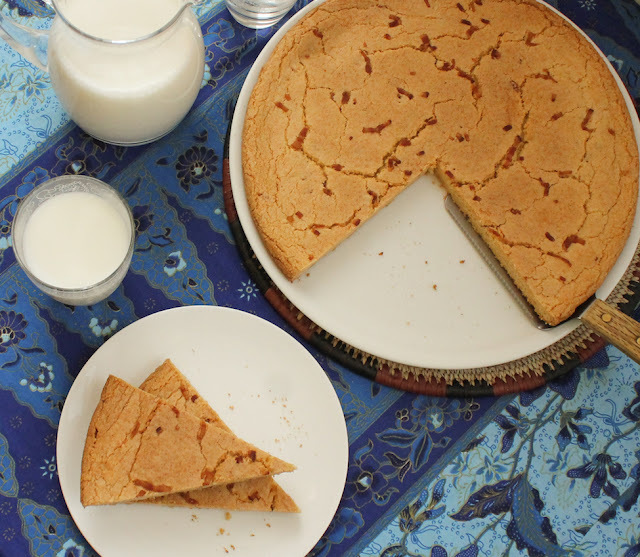 Wipe the skillet with a paper towel so it’s just greased enough to bake the big cookie. Set aside. Add in the bacon fat and egg and mix them in with the beaters on low. Increase the speed to medium high again and beat for eight minutes, scraping down the sides of the bowl occasionally with a rubber spatula. 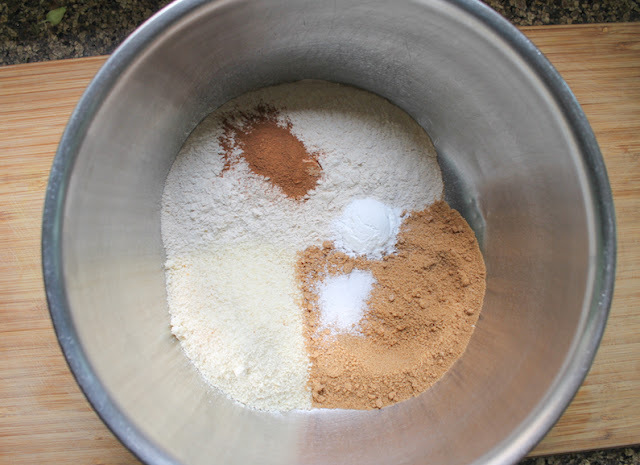 Whisk the dry ingredients together in another bowl. 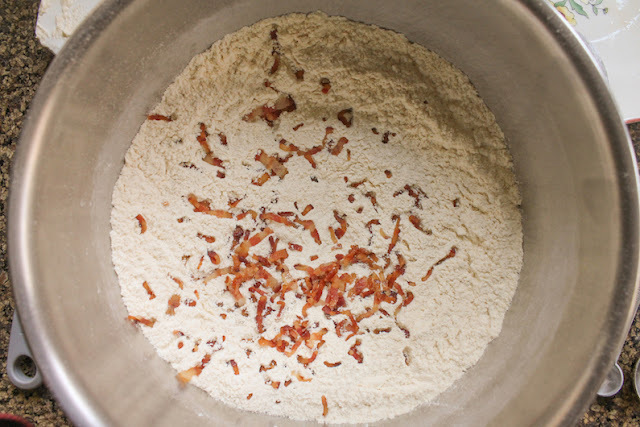 Set aside 1 tablespoon of the bacon bits and then mix the rest into the flour. 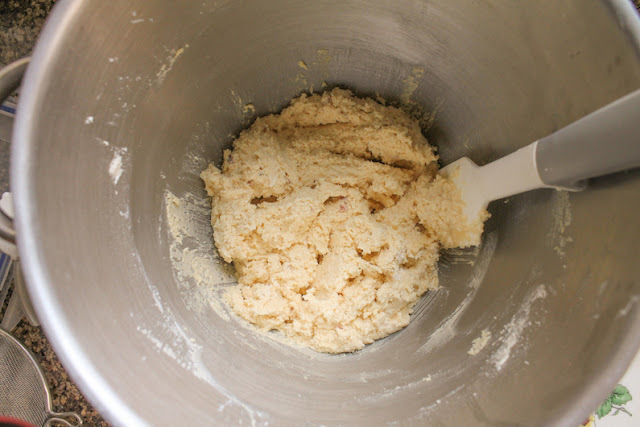 Add all of the dry ingredients into the other mixing bowl and with your mixer or beaters on low, beat just until it all comes together as a dough. Cover your work surface with cling film and tip the dough out onto it. Press the dough into a circle of about 11 inches or 30cm across. Cover it with another piece of cling film and smooth out the surface. Slide the dough circle onto a cutting board or baking pan and chill thoroughly in the refrigerator for at least one hour. Remove the cling film and ease the dough circle into your iron skillet greased with bacon fat. Sprinkle on the reserved bacon and pat the pieces in gently so they stick. Bake for 18-22 minutes, turning the skillet around halfway through to make sure that cookie bakes evenly. Leave the cookie to cool in the iron skillet. 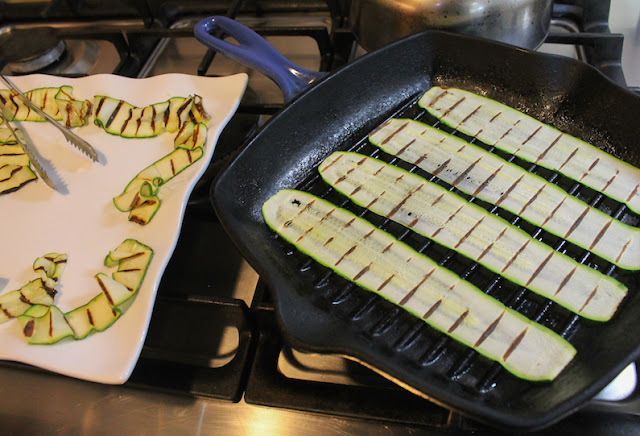 You can serve straight from skillet or turn it out onto a serving plate. 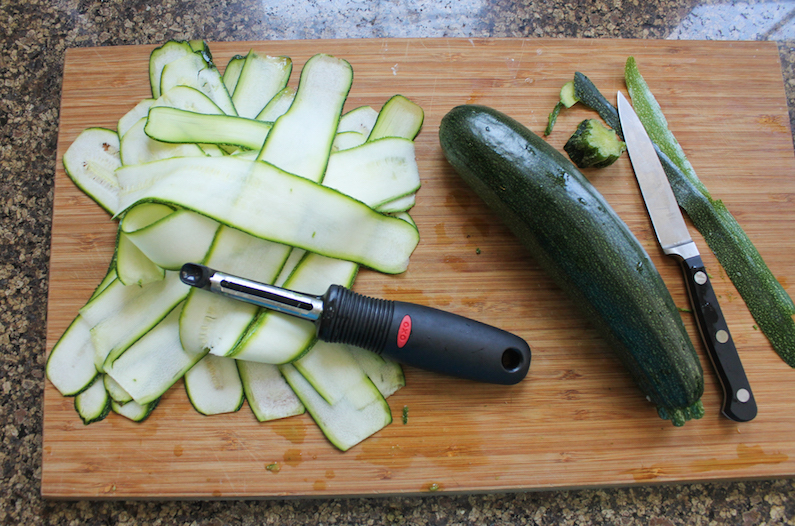 Cut it into wedges with a sharp knife. 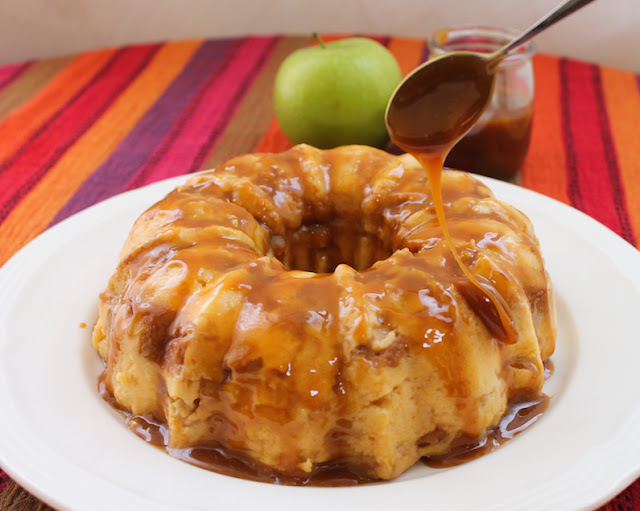 Tart apple, sticky toffee and vanilla custard filled bread come together in this toffee apple bread pudding Bundt to create a dessert that is way more than the sum of its parts. My husband is a huge fan of bread pudding but I must confess that it’s not my favorite dessert. I do love that is uses up leftover stale bread though, so I make it from time to time. The problem is that he eats just two or three servings, and then I have leftover bread pudding! First world problems, I know, I know. I hate waste so I’ve started working smarter. This recipe is made in a 6-cup Bundt pan (<Amazon affiliate link) so that’s four generous servings or 5-6 skimpy ones. 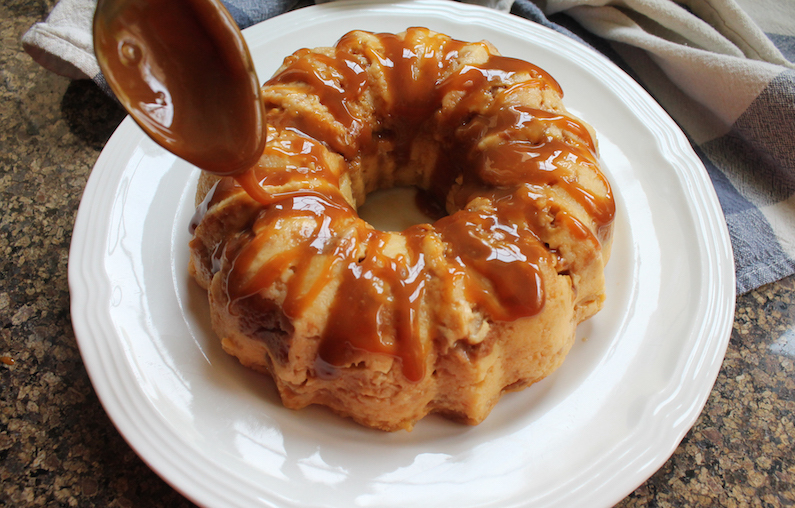 I promise you, no one will want a skimpy serving of toffee apple bread pudding! 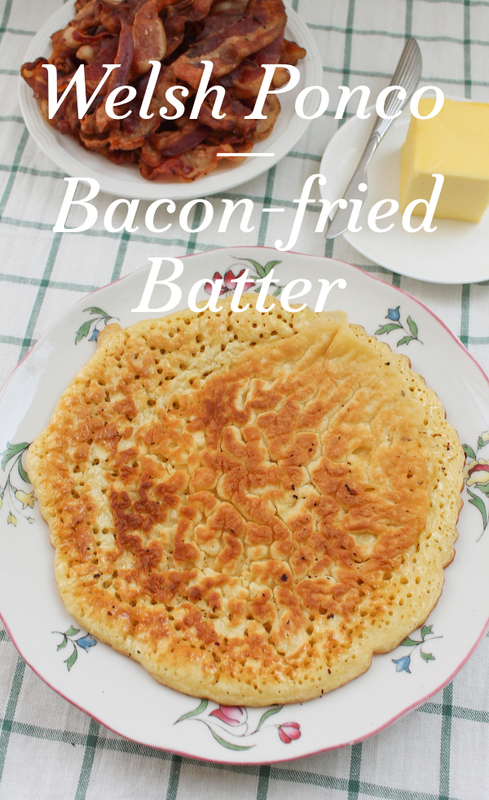 This recipe is adapted from one on the BBC Good Food site. 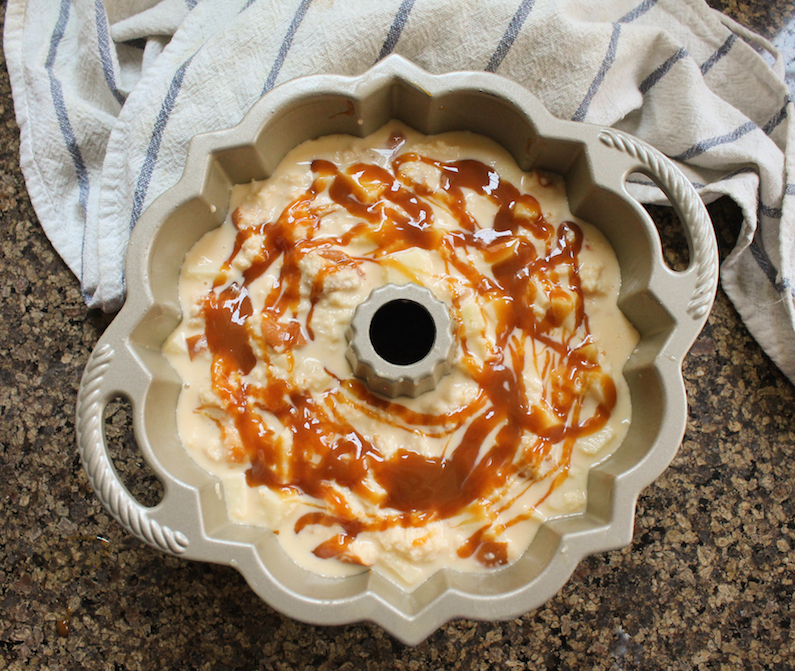 The caramel can be homemade or store-bought. All caramel is good! 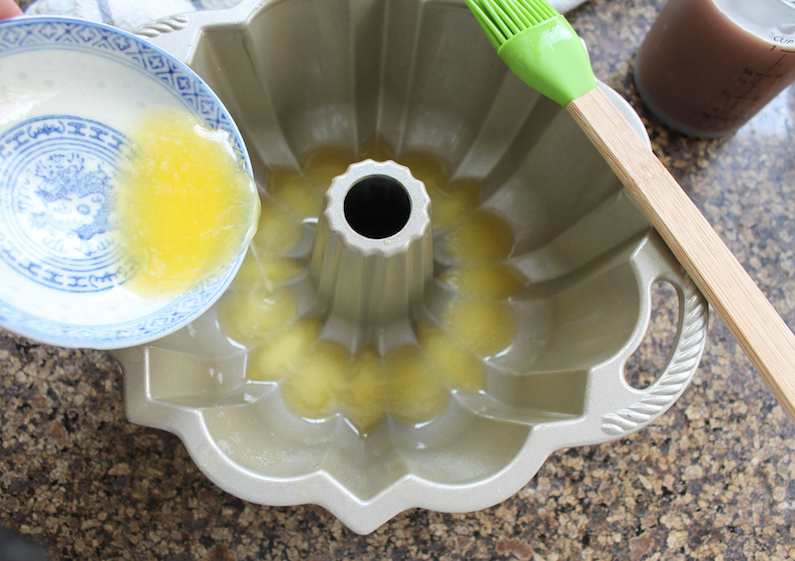 3 tablespoons butter, melted and cooled, for buttering 6-cup Bundt pan. 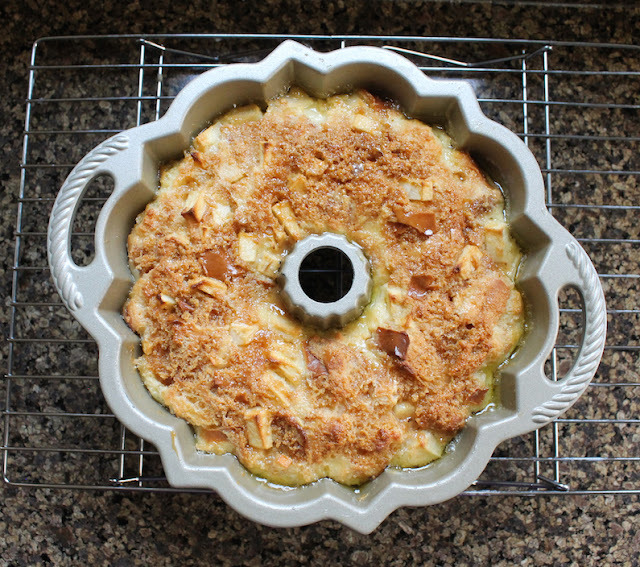 *Note: You can substitute another stale bread but buttery brioche makes a richer bread pudding. Also, the crusts are tender so they don’t have to be removed. 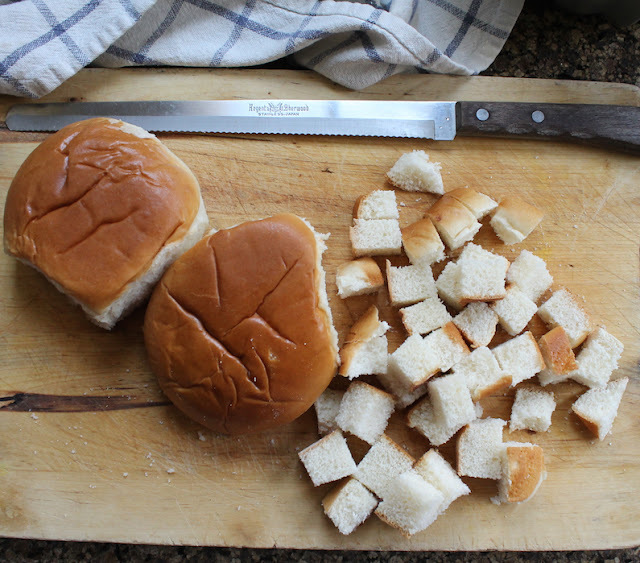 Cut the brioche buns into small cubes and set aside. 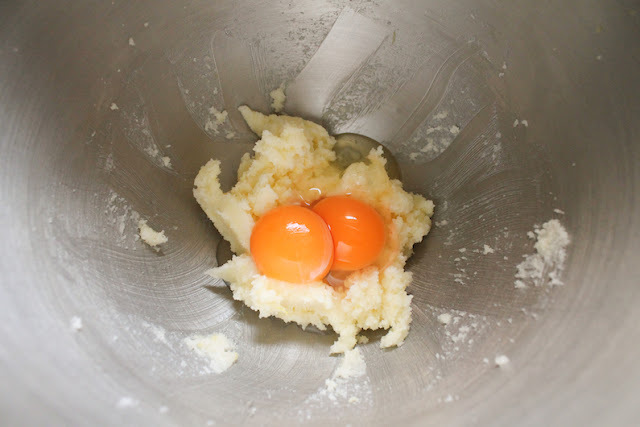 In a large mixing bowl, whisk the eggs, milk, cream, vanilla extract together with the 4 tablespoons sugar. Core and peel the apple, then chop it into small chunks. 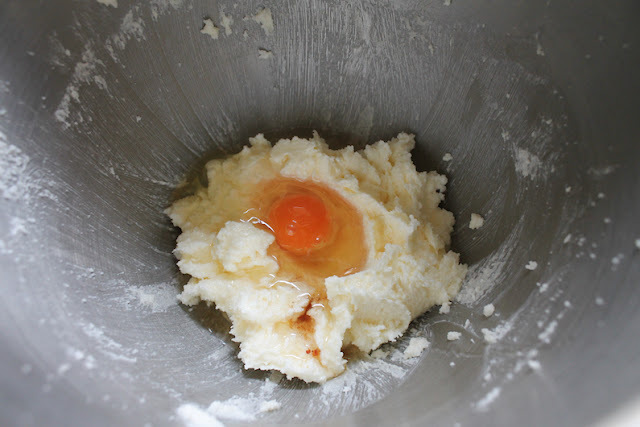 Toss the chunks immediately into the egg mixture so they don’t turn brown. 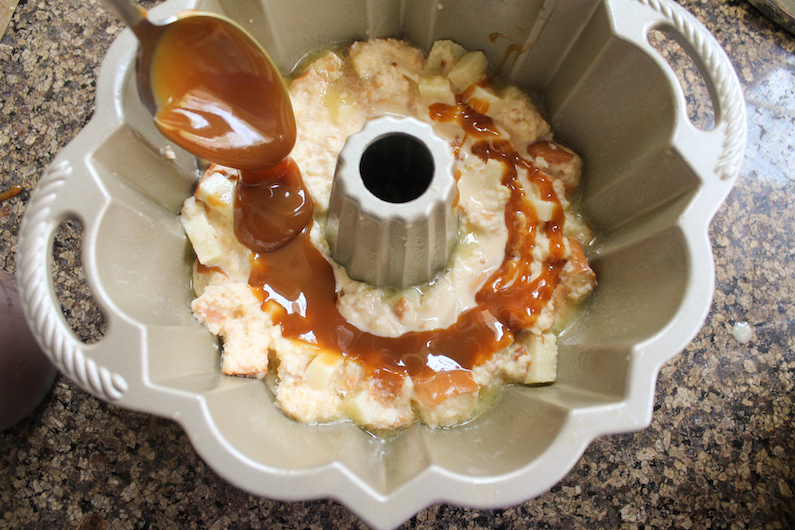 Stir the bread cubes through the apple/egg mixture. 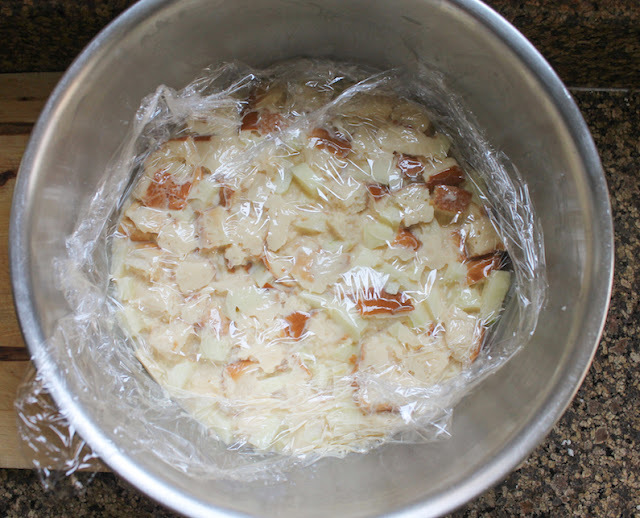 Cover with cling film and refrigerate for 30 minutes. When the refrigeration time is up, preheat your oven to 350°F or 180°C. Using a pastry brush, liberally butter the Bundt pan with the melted butter and pour the rest of it into the bottom of the Bundt pan. Spoon 1/3 of the pudding mix into the pan. Spoon about 1/4 of the caramel into the pan. 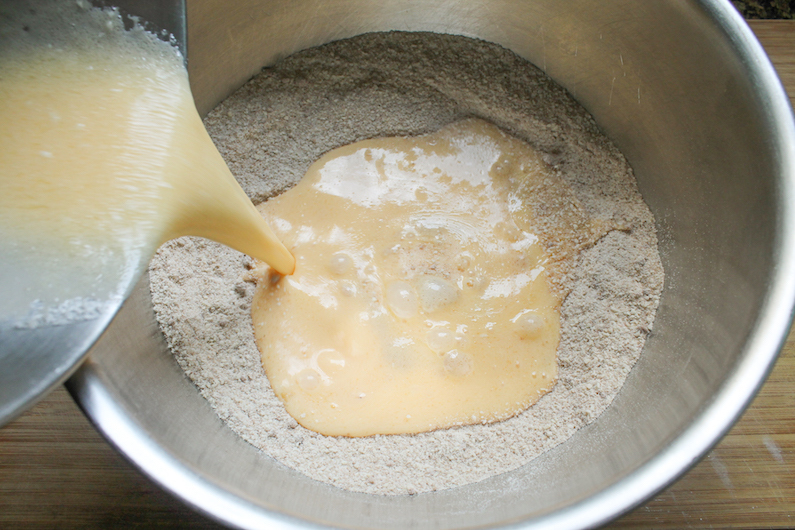 Top with another 1/3 of the pudding mix, followed by another 1/4 of the caramel. Finish with the rest of the pudding mix followed by another 1/4 of the caramel, reserving the final 1/4 of the caramel for pouring over the finished apple bread pudding. 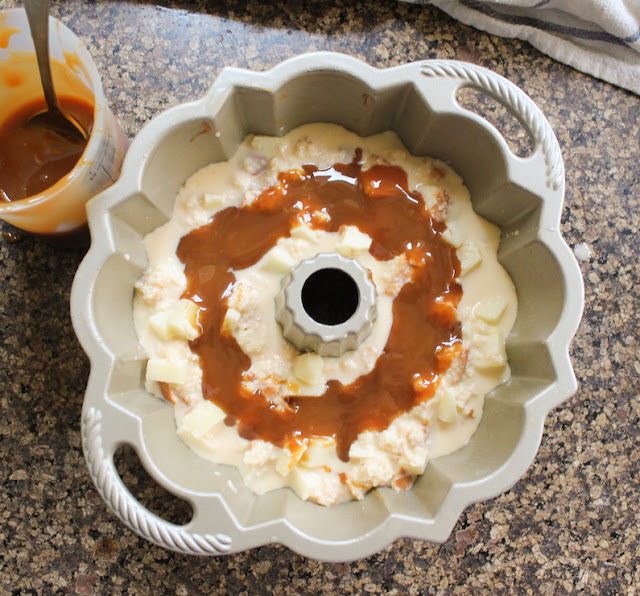 Put the Bundt pan inside another larger cake pan and put your kettle on to boil. Put the pans in the preheated oven and carefully pour boiling water into the bottom pan to about halfway up that pan. 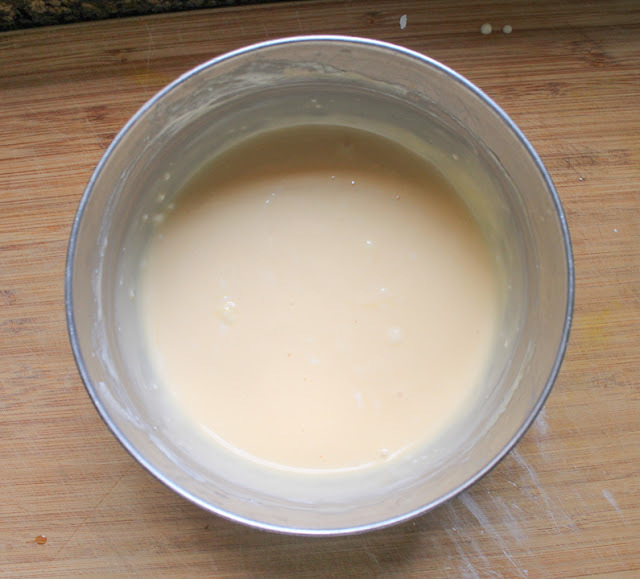 Bake for 35-40 minutes until the top is golden and the custard has set. You should see some butter bubbling up around the edges. Cool for 10 minutes on a wire rack then invert on a plate. This toffee apple bread pudding Bundt can be served immediately with the reserved caramel on the side. 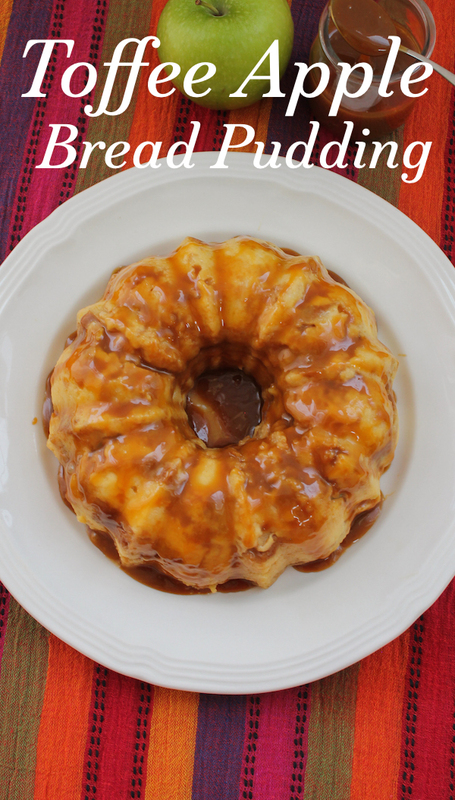 Or continue cooling it completely and drizzle on the additional caramel before serving. If you have even more caramel than the recipe calls for (My store-bought jar held more that one cup.) serve those leftovers with the pudding. 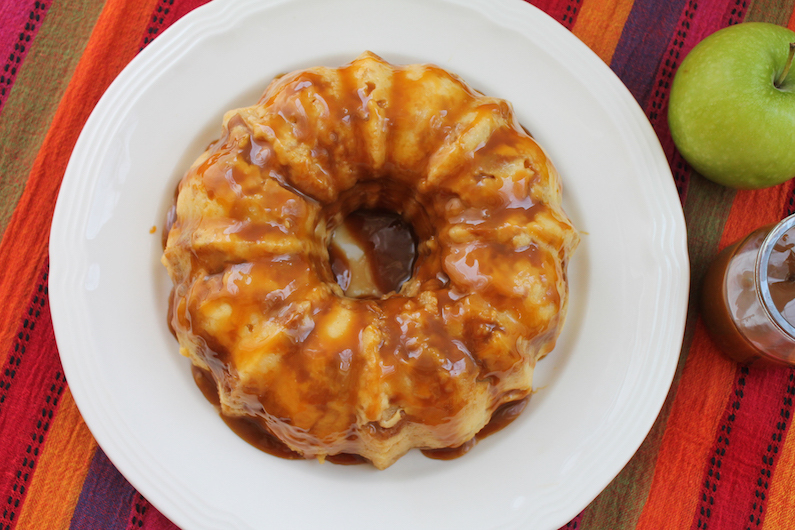 Because more caramel is always better. Many thanks and happy birthday month to our host Wendy from A Day in the Life on the Farm. 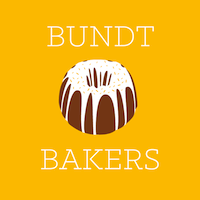 Check out all the lovely apple Bundts we are sharing today! Ponco is a traditional Welsh breakfast recipe of batter fried in flavorful bacon fat. Made with flour, milk and eggs (or sometimes just flour and milk) ponco is cheap and filling but, oh so delicious! A few months ago, I visited Wales for the first time to stay with a dear friend who had recently moved there. Despite still learning her way around, she was an excellent tour guide, enlisting her mother and father in a couple of our expeditions since they have lived in Wales for many, many years. But one day we struck out on our own to climb the town and castle walls around Conwy which date back to medieval times. High up above the town, we had lovely views of houses and shops and even the sea. We enjoyed a delicious pub lunch in town and headed home by way of the beach road, popping into a few shops on the way. In one tiny book store, I came across a small book of recipes called Croeso Cymreig - A Welsh Welcome. Recipes for Some Traditional Welsh Dishes. Published in 1957 by the Wales Gas Board, it was full of old-fashioned and traditional recipes, many with vague instructions and random units of measure, when they were included at all. Of course, I had to buy it. 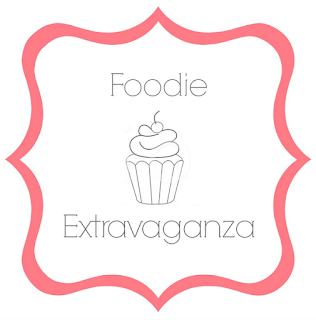 This month for Bread Bakers, our host Felice from All That’s Left Are The Crumbs chose breakfast bread as our theme. I like to try different breads from different cultures so I googled British breakfast breads, among other things. A Welsh recipe call ponco popped up a number of times. It sounded like a cross between an American pancake and a French crepe but fried in bacon fat, an idea I was totally for. 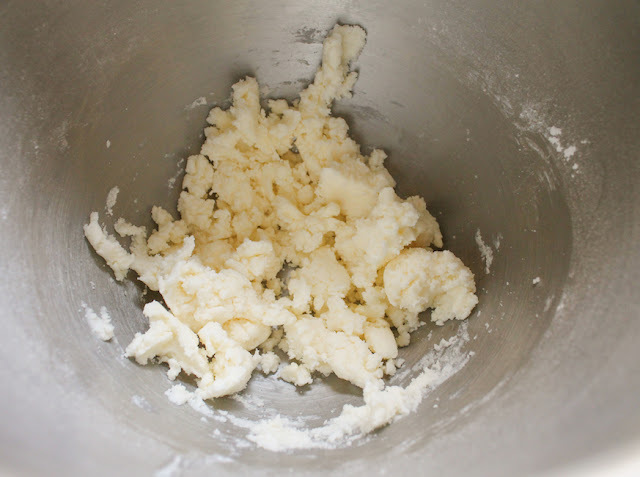 The recipes I found didn’t have very accurate measures but the idea was to make a batter with eggs, milk and flour or sometimes, I guess when times were tough, just flour and milk. Or even, God forbid, water. It suddenly occurred to check A Welsh Welcome. Sure enough, ponco was there! Its measurements were just as sketchy though. And this was the first time I saw the suggestion to eat it with meat and vegetables. Everywhere else it was a breakfast dish. Sure two teacups of flour, but how much milk? And no eggs in this case. Without a definitive recipe to go on, I winged it. This makes one large ponco about 9-10 inches or 23-25cm across. If you have a cast iron pan, use that for the frying. 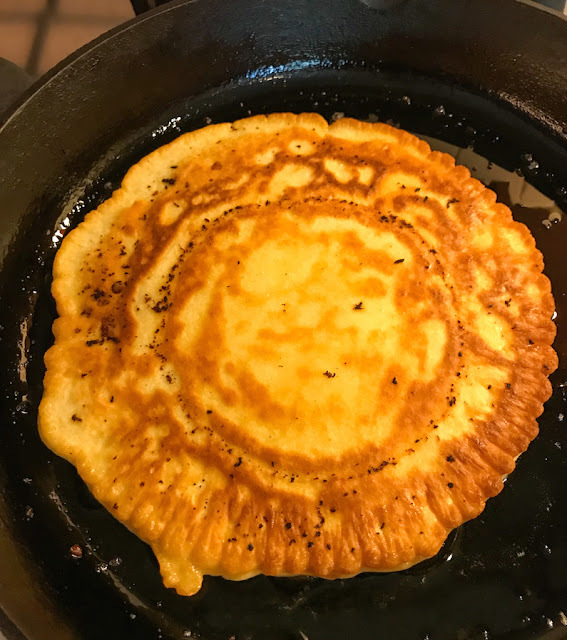 Cast iron won't cool as fast when you pour the batter in, which means the bacon grease stays hotter too and that means a more even color and slightly crunchy ponco. Which is what we want. 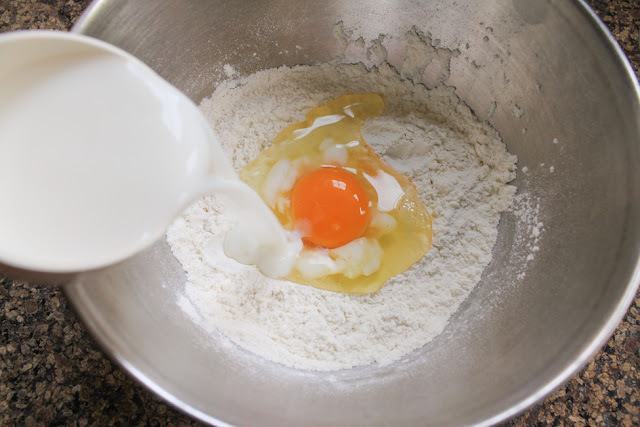 Whisk the flour together with the baking powder and salt in a mixing bowl. Add in the egg and 1/2 cup or 120ml of the milk. Whisk briskly. 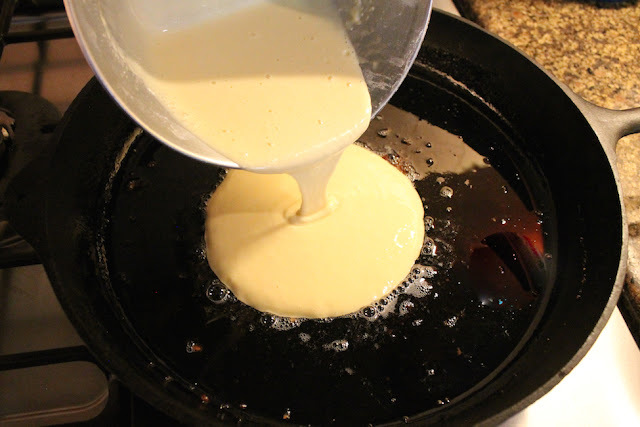 Add more milk as necessary to get a medium thick batter – not a thick as for American pancakes, not as thin as for French crepes. All at once, pour in the batter and turn the heat down to medium. 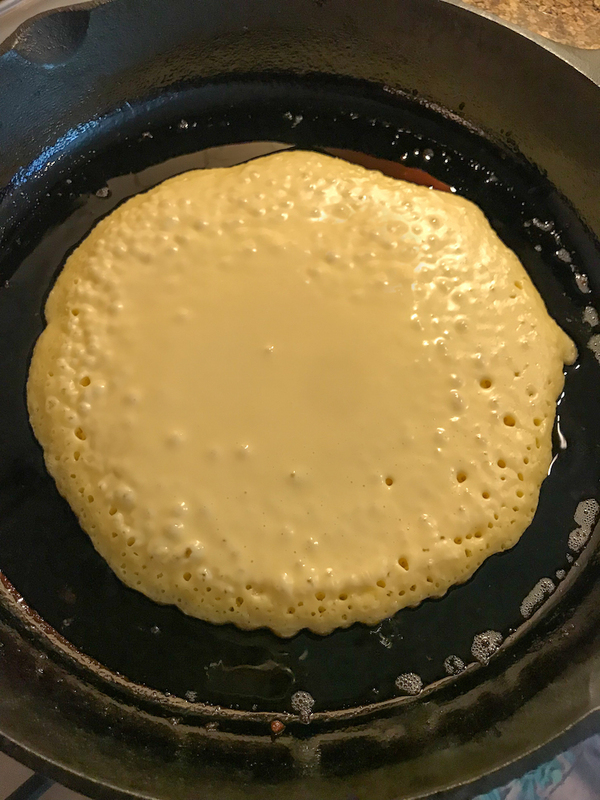 Cook the ponco until the bottom is golden and little bubbles form and pop all over it, with just the very center still liquid. This takes just a few minutes. I let it cook just a minute or so longer than this. Turn it over very careful so you don’t splash hot bacon grease on yourself and cook the other side till golden. You can see here how some of the sticky bacon bits have become one with the ponco. So good! I placed the ponco on a couple of paper towels briefly to absorb excess grease when I took it out of the pan, but honestly, it was surprisingly not very greasy. 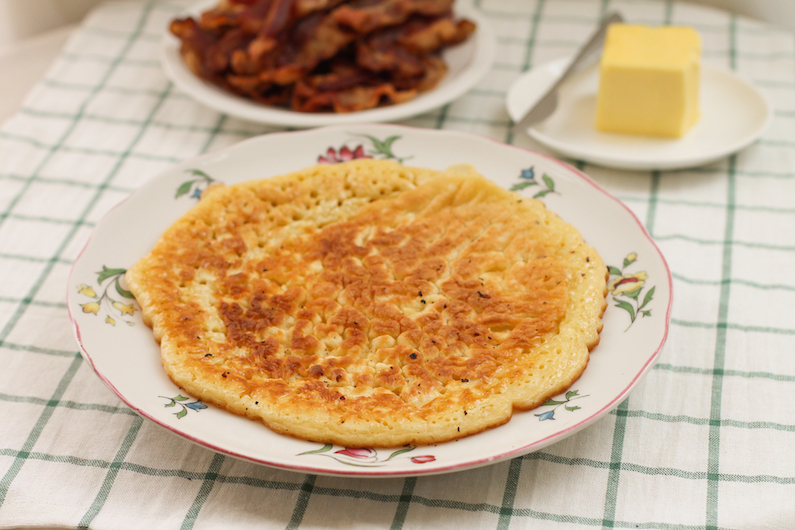 Some of the Welsh ponco recipes I found said to serve it with butter and bacon. I’d also suggest some golden syrup or honey to join the butter in filling those wonderful holes. Many thanks to Felice from All That’s Left Are The Crumbs for hosting this month. 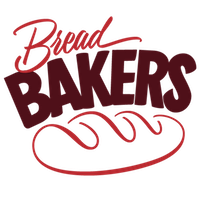 Check out all the great breakfast bread recipes! 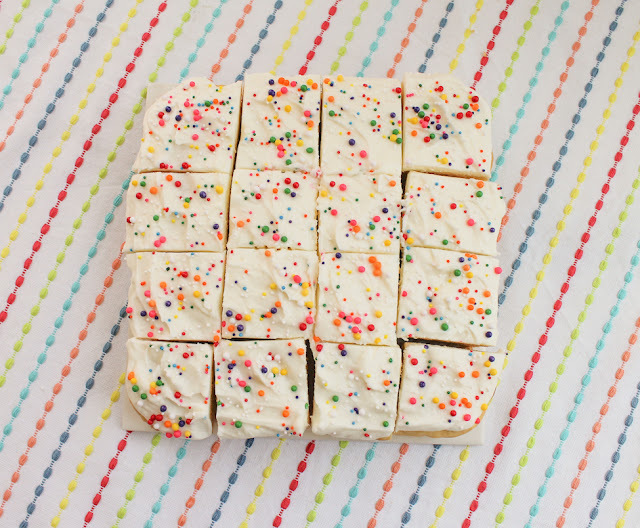 When you are craving sugar cookies but can’t be bothered with rolling out dough and using cookie cutters, make frosted sugar cookie bars instead! They are super simple and are as pretty as they are tasty. There’s a certain pace and skill to baking sugar cookies that can’t be rushed. 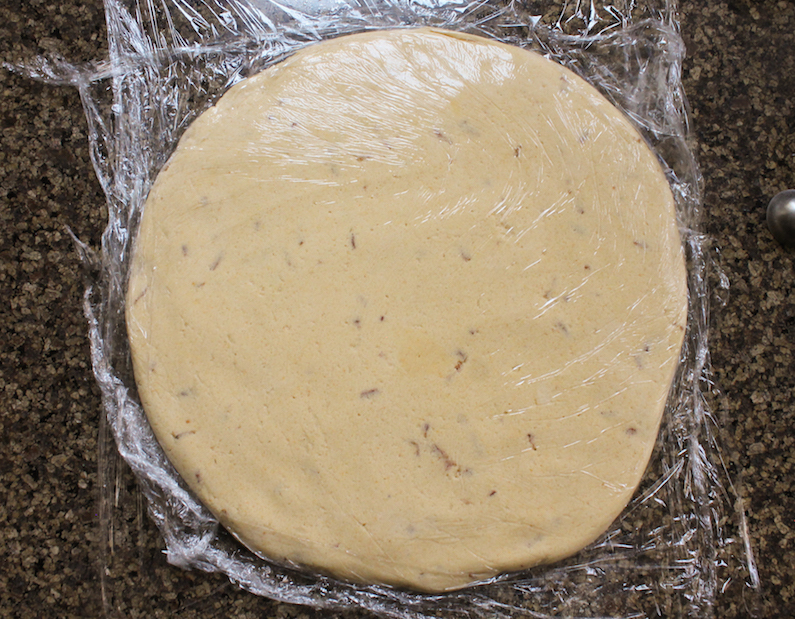 Once you’ve mixed the dough, it needs to chill well before rolling. And you can’t roll it all out at once or it softens and won’t peel off the work surface. And you can’t roll it too thin or it breaks when you try to peel it off. It’s a practice makes perfect operation. 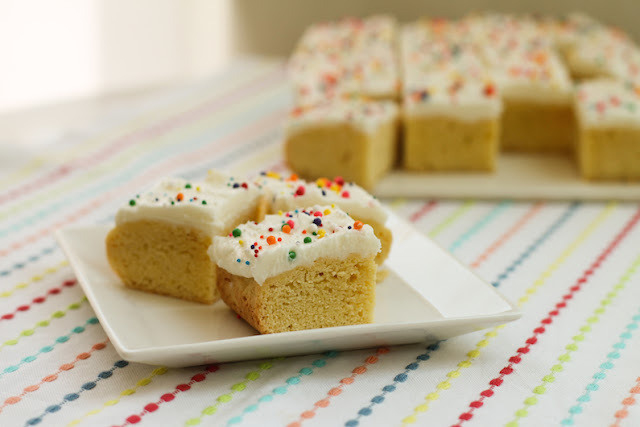 That’s where frosted sugar cookie bars pull out ahead in the tasty but easy race. One bowl dough, no chilling, no rolling, no cutting until after they are baked! Are they pretty shapes? Well, they aren’t Christmas trees, but they are neat squares. Who doesn’t love a good square? This recipe was adapted from A Little Bit Crunchy A Little Bit Rock and Roll, which makes a huge 13x18 in or 33x46cm pan. 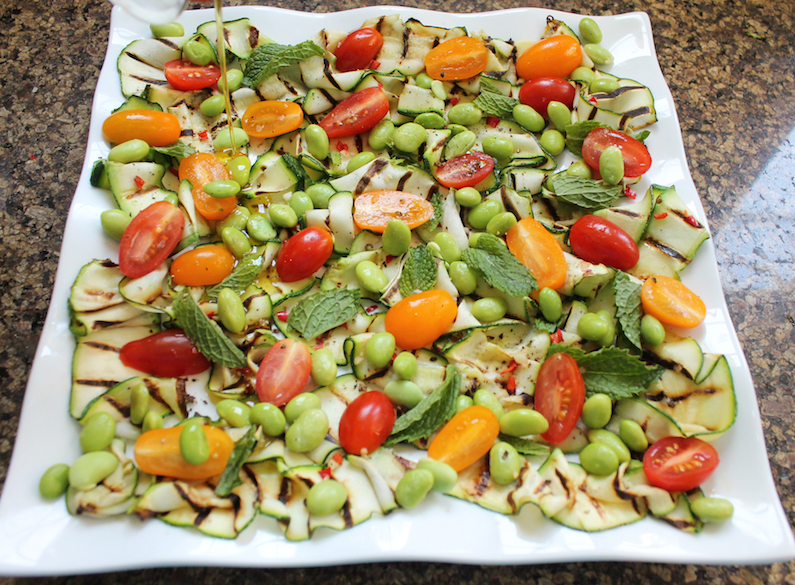 If you are feeding a crowd, you will want to head over to the original recipe and maybe just add in some lemon. 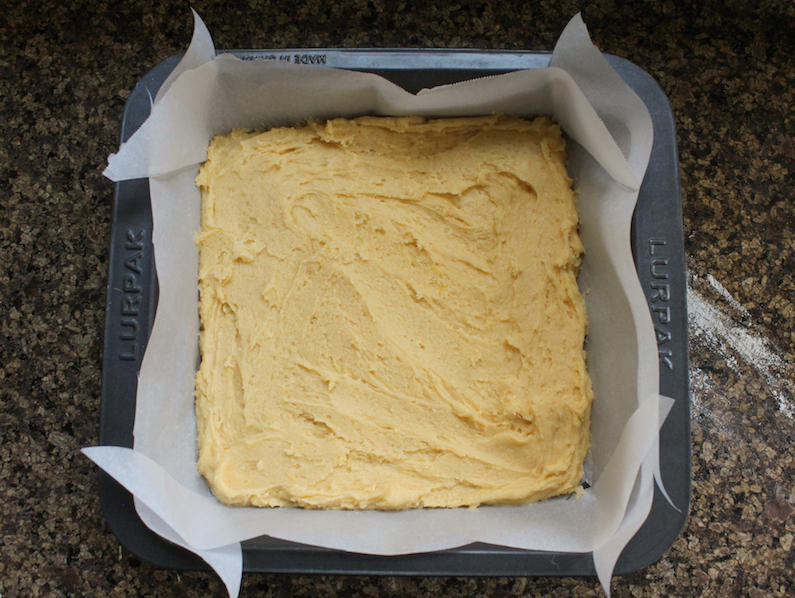 Prepare your 8x8 in or 20x20cm pan (You can use a 9x9 in or 23x23cm pan for slightly thinner bars.) 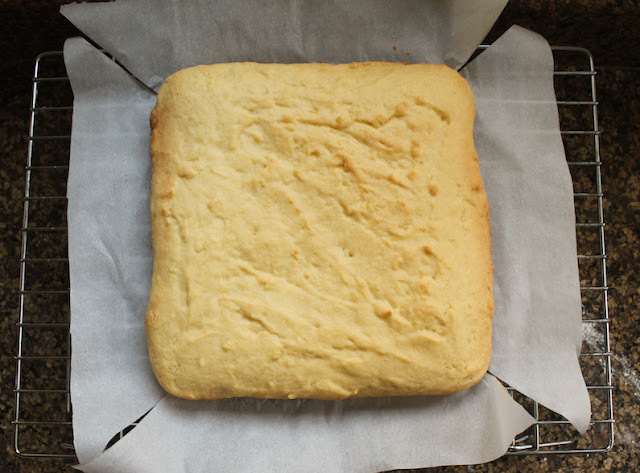 by greasing it or lining it with baking parchment. Preheat your oven to 350°F or 180°F. 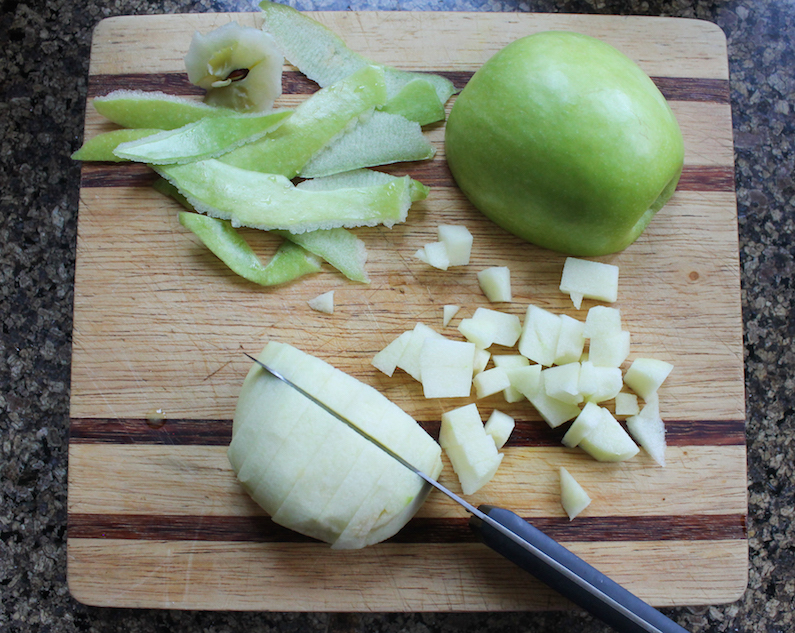 Beat the sugar and lemon zest together. Add in the butter and cream until fluffy. 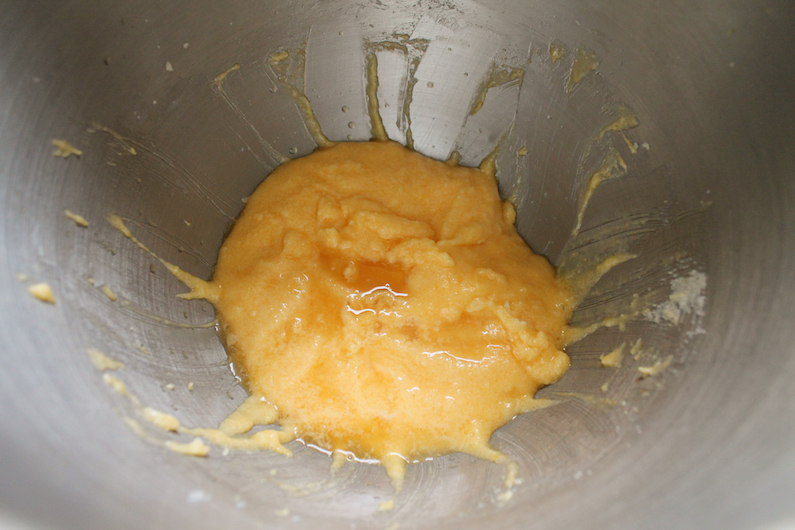 Add the egg and egg yolk and beat until well combined. Add the vanilla and lemon juice to the creamed mixture. In another bowl, whisk the dry ingredients together. Then with the beaters on slow, add the dry ingredients into the batter bowl. 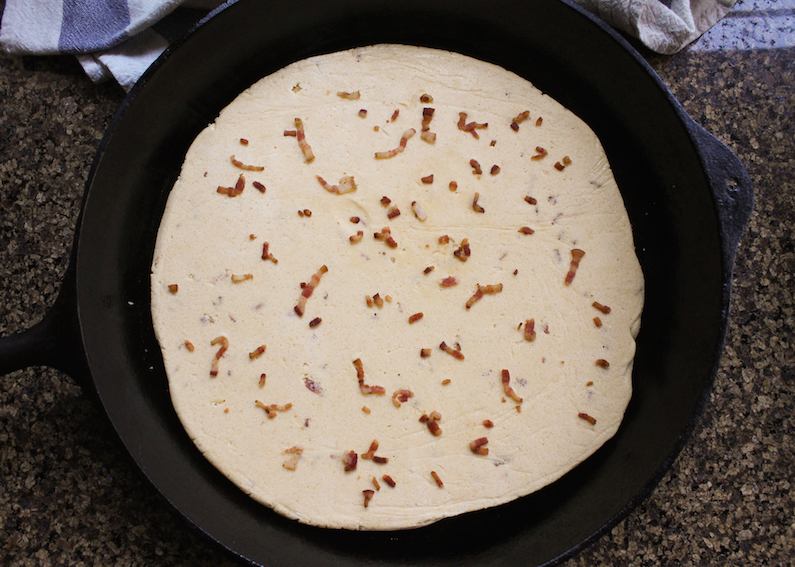 Tip the dough into your prepared pan and spread it out evenly, all the way into the corners. 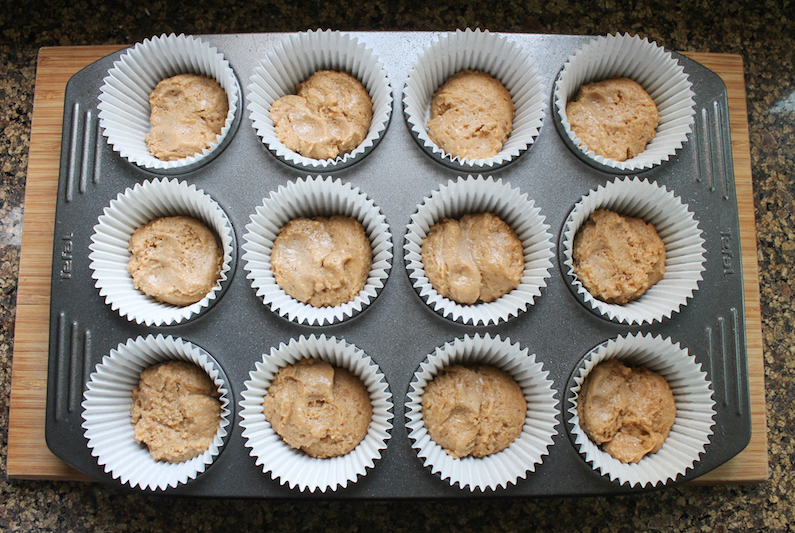 Bake in the preheated oven for 14-16 minutes, or until it is just starting to brown. Cool the cookie bars on a wire rack until completely cool before frosting. 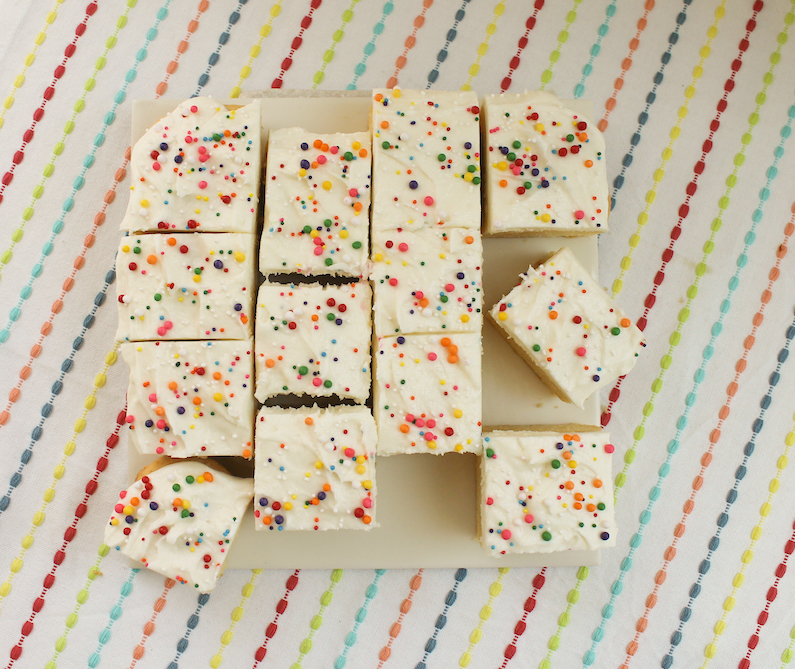 While the cookie bars are baking, you can make the frosting. 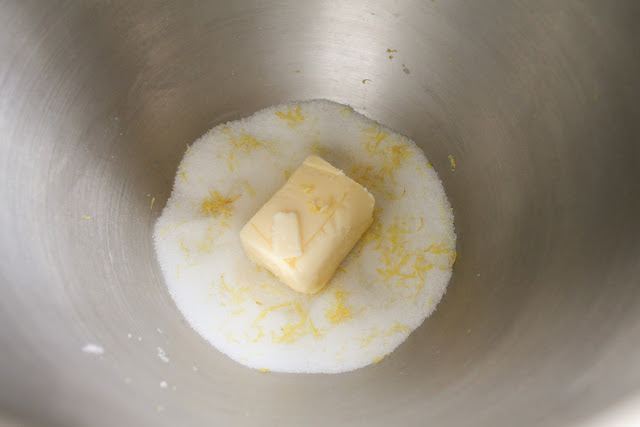 In a mixing bowl, beat the shortening and butter together. Add the powdered sugar and vanilla and beat well until the shortening and butter are fully incorporated into the sugar. Gradually add the milk, one teaspoon at a time, beating well with each addition until you get a spreadable frosting. You may not need all of the milk. 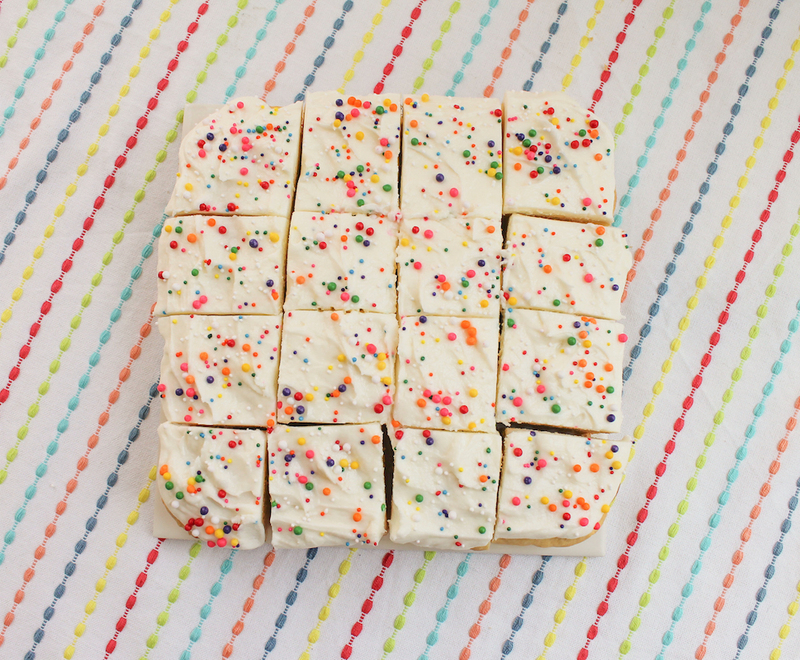 Once the sugar cookie bars are completely cooled, get your sprinkles ready. Pile the frosting on the cookie and smooth it out. I like to leave some dips and ridges to catch the sprinkles. Immediately shake on your sprinkles so they’ll stick. 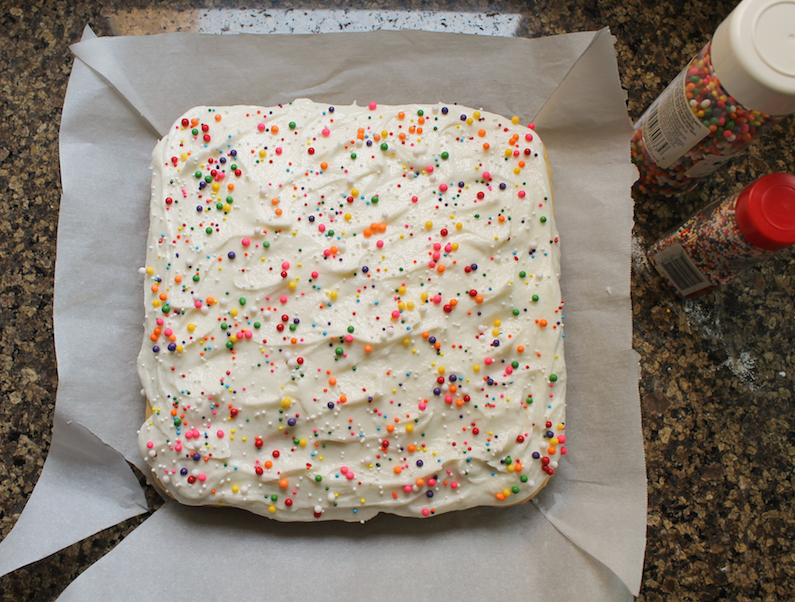 I used two different sizes of sprinkles because I have a huge collection and it seemed like the right thing to do. 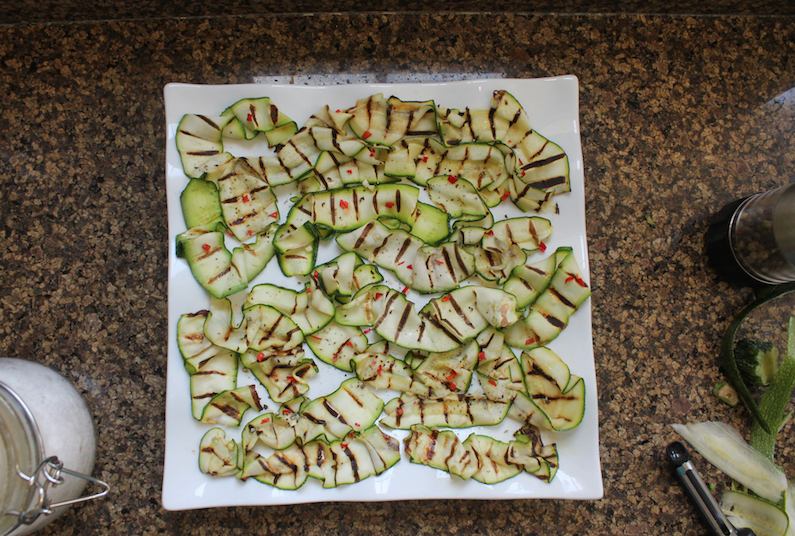 Chill for about 10-15 minutes, uncovered, then use a sharp knife to cut them into squares. 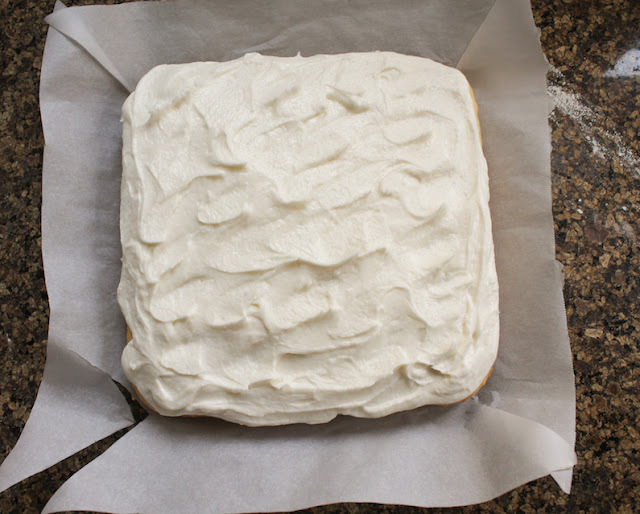 The frosting will firm up as it dries out. Once this happens, cover with cling film or store in an airtight container. 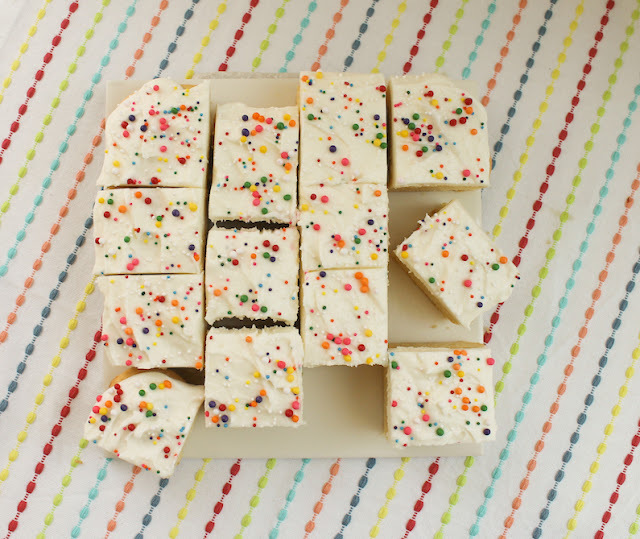 Do you love the ease of baking brownies or cookie bars too? 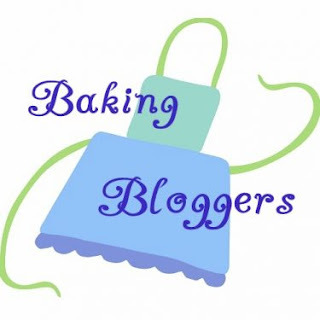 You are going to love this month's list of recipes from my fellow Baking Bloggers. Many thanks to our host Wendy of A Day in the Life on the Farm for her behind the scenes work.